Recently someone asked me what makes a person a Catholic. I don’t know if I have ever been asked that question before in my 56 years as a priest. I had to think. Certainly being baptized in a Catholic church is part of the answer. But there are many who are baptized in a Catholic church as a child but are not brought up Catholic by their parents and do not identify themselves as Catholic in their adult life. So there is more to the answer than being baptized in the Catholic Church. As I gave more thought to the question I began to think of the many things that make a person a Catholic. There are our Catholic beliefs, doctrines, and moral teachings. The Eucharist is at the very center of Catholic worship. 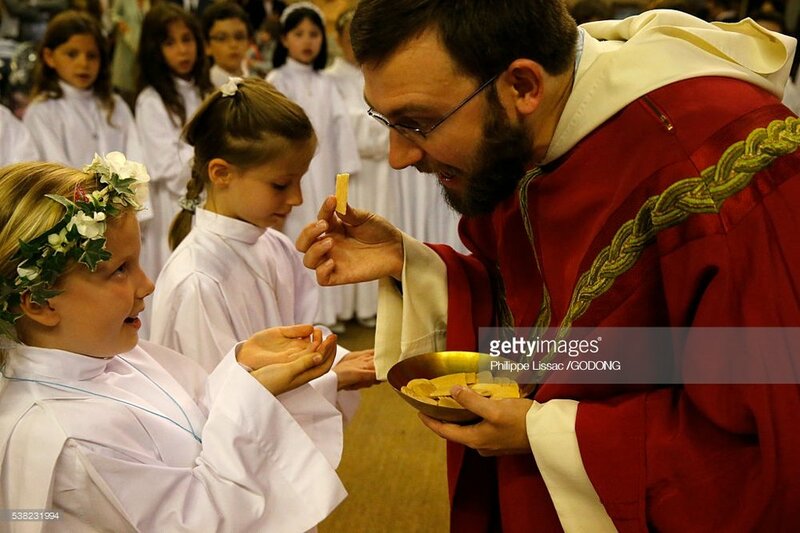 We Catholics accept seven sacraments as given to us by Jesus. We have created over the centuries many sacramentals like the rosary, novenas, statues, vigil candles, crucifixes and crosses we wear around our necks, and countless others. In addition to Sacred Scripture, we Catholic accept Tradition as part of God’s revealed word. Our Catholic worship is ritualized when compared to most other Christian denominations which use little ritual. We accept a hierarchy in our Catholic faith: the Pope, bishops, priests, deacons, and laity. We accept that the Pope and bishops have teaching authority. Devotion to Mary and the saints (St. Anthony, of course) is natural for us. Many Catholic devotions and customs are unique to us, for example, Benediction, the Way of the Cross, the Rosary, and abstaining from meat on the Fridays of Lent. Some gestures such as the Sign of the Cross and genuflecting when we enter and leave church are very Catholic. I think I have listed most of the things that identify a person as a Catholic. I suspect there are others I have failed to list. When all is said and done, there are many things that make a person a Catholic. Very importantly, let us hope that people identify us as being a Catholic because of the good witness we give in the way we lead our lives. St. Anthony help me to be the kind of Catholic you were, always faithful to living the Gospel life of Jesus.